I picked up these blackberry candy twists at Target and thought they'd be cute as giveaways at a costume party DH and I are going to in a few weeks. I made the card for our friends that are hosting the party. It coordinates with the candy wrappers. All stamps are from the Frightful Night stamp set. The tree was stamped onto Vellum cardstock with Versamark, then I sprinkled on some heat and stick powder, heated it with a heat gun to activate the stickiness, sprinkled on some of Taylor's Black Ice glitter, and then heated it again to set the glitter. This is called the Glitter Surprise technique...it was one of the SCS Technique challenges a couple weeks ago. The bats on the white angled panel were done the same way. The layout started off as Taylor's TECC36 sketch from this past Friday.....but it turned into something completely different by the time I was finished. The Vellum was attached to the black mat panel with the black brads from Taylor's Halloween Key Ingredients pack. The black mat panel behind the tree, orange mat panel, and punched sentiment are all up on separate layers of dimensionals. The bats on the black panel were stamped in Versamark and heat embossed with black embossing powder. The ribbon is from Taylor's Birthday Girl Key Ingredients. The inside panel is white with some more heat embossed black bats down in the corner, stamped on a black angled piece of CS. The black scallop wrapper that covers the candy twists was done using one of my largest scallop circle Nestabilities. I added a thin strip of sticky strip along the bottom to hold the bottom row of candy in place, folded the scallop wrapper up around each side, and tied it with Taylor's ribbon. 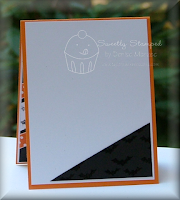 The bats are from the Frightful Night stamp set. They were stamped in Versamark and heat embossed with black embossing powder. The white oval was punched with a scallop oval Nestabilities die. Thanks for visiting the SASI blog today! Denise, what a great card and candy gift! I LOVE it! both your card and your candy gift is too cute! love it! What a cute project, Denise!! LOVE the card!! What an adorable set, Denise!! Love your card and candy wrapper!! Great card and treat! Love the lay-out and the glittery tree. TFS! What a cute card and gift Denise! I love the candy sticks! Ive never seen blackberry before. May have to check that out!LOL! Super cute project Denise! I need to try some glitter surprise I think! Denise - once again I think your project turned out awesome - love both ideas!!! Another great creation, Denise! Perfect combination for Halloween giveaways! 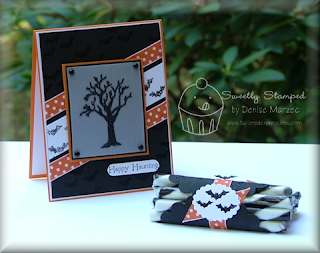 What an adorable project and idea...perfect halloween set! Way cool set!! Love the angled panels!! And I must have missed that glitter technique...thanks for sharing it here! !